Today we’re excited to announce that Bike SLO County Board Treasurer Tyler Wertenbruch is stepping in as Interim Executive Director for long-term Executive Director Dan Rivoire who recently stepped down to pursue other opportunities. Wertenbruch will helm Bike SLO County during the current transition on a volunteer basis. Welcome Tyler! “I’m honored to be able to serve and continue the great work Bike SLO County hasslated for the future as well as build on the legacy that all of our staff has built,” said Interim Executive director Tyler Wertenbruch. “We’re continuing all of our programs and advocacy efforts full speed ahead,” said Wertenbruch. 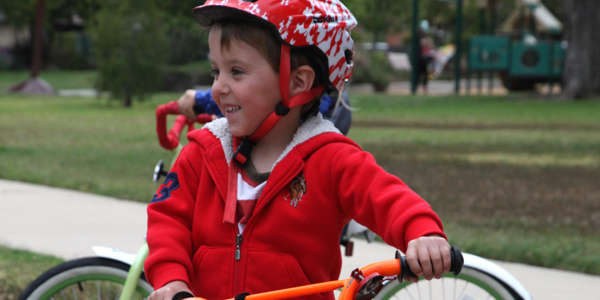 In addition to their Bike Education, Bike Valet and Bike Kitchen programs, Bike SLO County advocates countywide for safer streets for everyone, regardless of whether they drive bikes, walk and or drive cars. “The Board is thrilled that Tyler chose to step up as we begin our search for a new Executive Director,” said Bike SLO County Board President Chris McBride. “Tyler brings fresh energy and a wealth of experience with the organization. We’re confident that his vision for Bike SLO County will serve the bike community well,” said McBride. Wertenbruch previously served as Bike SLO County’s Board President and is currently the Board Treasurer. An avid cyclist, Wertenbruch rides with Team Clif Bar Cycling and will be competing this summer in the Mongolia Bike Challenge. In addition to serving as Interim Executive Director, Wertenbruch will continue his work as IT Manager at RRM Design Group in San Luis Obispo. Ring your bell and say hello next time you see Tyler biking by! This week we’re saying a bittersweet farewell to our Executive Director Dan Rivoire, whose parting words are featured below. We’re sad to see him go but we wish Dan all the best as he moves on to his next adventure here in San Luis Obispo. It is with a heavy heart and a significant bit of excitement that I wrap up my last day as Executive Director of Bike SLO County today. As all of you know, I love Bike SLO County from the depths of my soul. I started working with the organization as an Americorps member in February 2008. Over eight years later, I am lucky to be able to look back on so many positive memories working to improve local quality of life. I owe nearly every aspect of my professional development to our team and the incredible people that make up our local bike culture. Together, we have accomplished great things in San Luis Obispo and we are truly just getting started. Looking ahead, I know I will stay involved in many ways and will definitely be able to give back to the cause through my other roles in the community. I won’t be far, working at iFixit right on the other side of downtown, and wouldn’t be surprised if I find myself volunteering at events or the Kitchen in no time. If you would like to celebrate the big transition with us, please join us at Petra next Wednesday from 5-7 pm for a little going away social hour. Thank you all for everything. I’ll miss working so closely by your side. https://bikeslocounty.org/wp-content/uploads/2014/02/SpokenWheel_Dan-01.png 281 281 coalition2001 https://bikeslocounty.org/wp-content/uploads/2015/07/BSC_RGB_340_TEST1.png coalition20012016-06-10 15:31:102016-06-10 15:31:10Bidding Farewell to Dan! Who REALLY rides bicycles? Do you believe these bicycle myths? The study found that 1/3 of Americans rode a bicycle at least once in 2014. That is One-Hundred and Four MILLION people! Cars vs Bikes? Bikes vs Cars? There is an old perception that people who ride bikes are anti-car or don’t drive cars. To the contrary, 88% of the people who drive bikes also drive cars! While it’s true that more men than women ride bikes, Forty-Five Million Women drove bikes in 2014. That’s 44% of all Americans who got on a bike in 2014. Head over to People For Bikes for four more myths about people like you! More and more people are out on bicycles every day in SLO County! In reflecting on 2012 one thing remains clear; the Bicycle Coalition family is growing and everyone is feeling it! Everything we do is for our members. We loved getting everyone together through our new events, to share our vision for the organization and celebrate our collective love for bicycles and the quality of life in SLO County that we cherish dearly. Yet the Year of the Bicycle Coalition Member goes well beyond our events. Everywhere we went, we met people who just became members, all were energized and proud to be a part of our rapidly growing organization. We welcome these newcomers to the Bicycle Coalition family and can’t wait to see them at upcoming events, out on their bicycles, and sharing the community-minded vision of the Bicycle Coalition for years to come. If you haven’t joined yet, now is the time! We are THE voice for bicycles in SLO County, our numbers our growing, and we’d love to have you become a part of our vision for a more bicycle friendly community. *Our next Members Only Party is set for June 1, 2013 – and it’s a bicycle fashion show!